One of my childhood memories is gazing at an enormous pitcher of water with tea bags and a ton of cut lemon basking in the Summer's heat on my Aunt's sunny picnic table. Wondering how odd it was that the sun would cook the tea. I've tried to up the ante in my version by adding the herb Thai basil. Once again, my CSA threw me for a loop by giving me a huge -- I mean HUGE -- bundle of Thai basil. Thai basil is really nothing like sweet Italian basil because it has more of a licorice flavor and more spice. How do you use it? 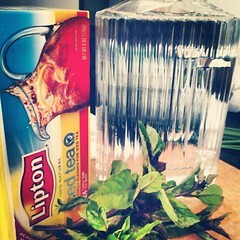 Place tea bags and basil in the pitcher with the water. Place in afternoon sun to steep. Steeping time depends on how dark you like your tea. Four hours for medium strength, eight for strong strength. 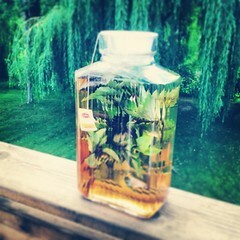 After done steeping remove tea bags and basil. Chill well. 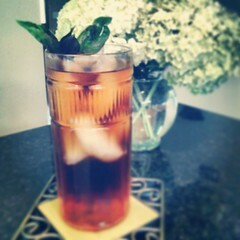 Serve over ice, sweetened if desired and garnished with more basil and/or lemon.